Medieval architects were masters at building with stone. But as cathedral design evolved, some medieval architects began to push beyond the boundaries of known structural design and into unknown territory. With the pursuit of taller and taller cathedrals, any errors could lead to catastrophic collapses. 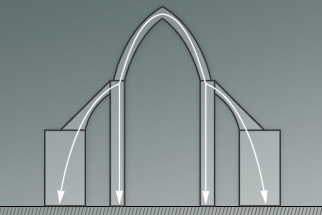 In this interactive, try your hand (safely) at constructing a cathedral arch and learn more about the physics behind the arch. See if you can build a cathedral arch without it collapsing, and learn more about the forces at work. Editor’s Note: The arch diagrams and thrust lines are simplified for illustrative purposes. Our interactive arch exists in a virtual world that does not completely reflect real-world physics.